Mining and metals investors dumped the sector's big names on Wednesday after sharp drops in base and precious metal prices over concerns of emerging market contagion from the currency crisis in Turkey, worries about the robustness of the Chinese economy and the impact of widening trade war sparked by US tariffs. Copper touched a low of $2.55 a pound ($5,622 a tonne) in New York and entered a bear market, falling more than 20% from a near four-year high struck little over two months ago. Late-breaking news that a strike had been averted at the world's largest copper mine responsible for close to 5% of global supply put a cap on hopes of a rapid recovery for the bellwether metal. Nickel, exchanging hands for $13,185 a tonne is the only metal in positive territory for 2018 thanks to forecasts of a demand boom from batteries used in electric vehicles. 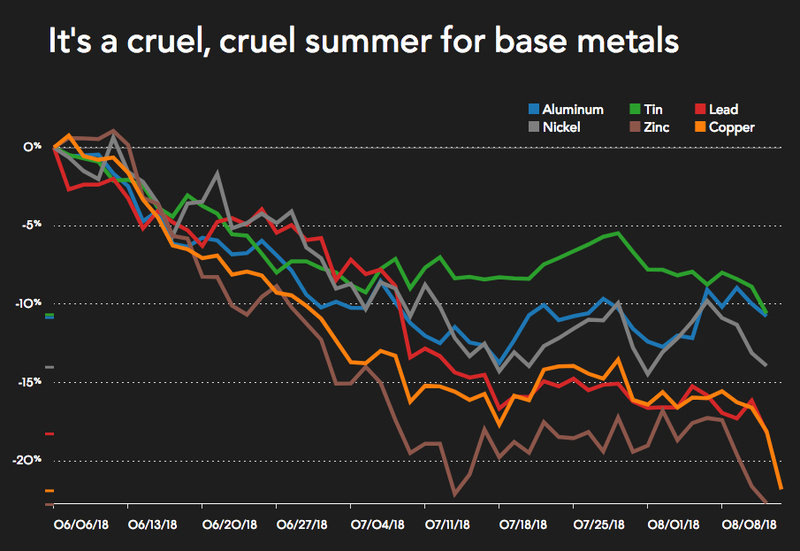 After fresh falls on Wednesday zinc’s losses so far in 2018 is approaching 30%, the worst performer among base metals. “We simply have to look to commodities set by the physical market (chrome, vanadium, tungsten, steel rebar) to find price robustness reflecting underlying demand that seems to be okay. "Regarding copper specifically, the looming deficit of 415kt forecast this year will, in our view, cause new higher cost projects and greater scrap substitution, all of which demand a higher price than where copper is currently trading." The weakness on metal markets spilled over to mining equities pushing the sector into the red across the board. Shares in world number one BHP Billiton lost 4.8% in New York, although the Escondida news may lend some support to the stock in coming days. Rio Tinto, which holds a minority stake in Escondida, declined 3.3%. World number three copper producer Glencore was down 6% while Brazil’s Vale fell 5%. Copper producers were hardest hit with Antofagasta shares trading in New York dropping nearly 13%, China Molybdenum fell 12% while central Asian producer KAZ Minerals gave up more than 10%. The world’s top copper producer Freeport McMoRan declined 7.7% in massive volumes making it the seventh most-traded equity in New York. Investors found no solace in traditional safe haven gold with the precious metal setting a one-and-a-half year low of $1,182 an ounce on Wednesday. A drop to $14.38 an ounce meant silver’s losses year to date now top 15%. Platinum at $769.20 an ounce set a fresh 14-year low amid serious doubts about the long term outlook for the metal used in autocatalysts, while last year's best performing metal palladium is trading 22% weaker this year. The post Mining and metals markets crater as copper price enters bear market appeared first on MINING.com.